We are always after new volunteers at Pedallers’ Arms. Volunteering means greeting people and explaining how Pedallers’ Arms works, pointing them to the right tools and offering help if you (and they) feel comfortable. 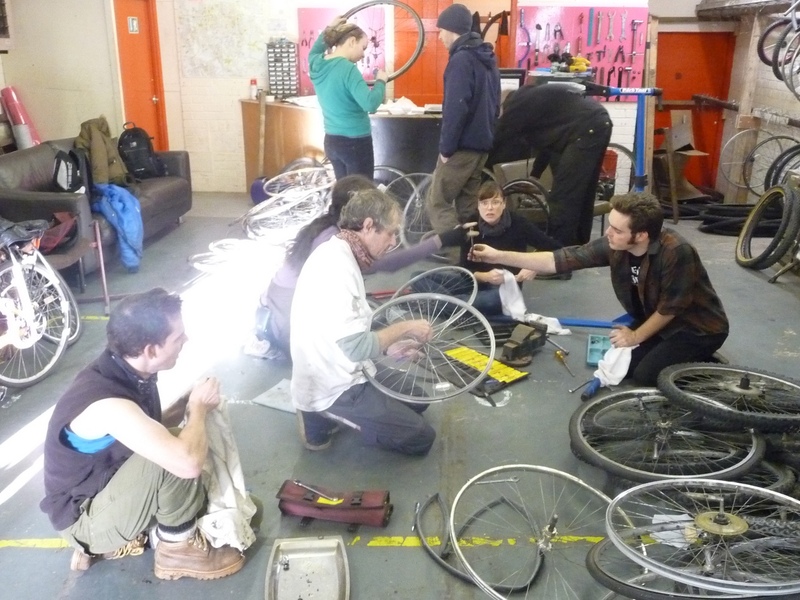 We want to empower groups of people who might not normally be empowered to repair their bike. Experience is helpful, but not essential, because anyone can participate in our learn-as-you-go approach. One of our on-duty mechanics will help guide you through the process, and you may also be paired with a more experienced volunteer. The emphasis is on “anyone can fix their bike” we have the tools and we will be learning together. Please note: we are often very busy and cannot commit to teaching you everything you may wish to know about bike mechanics but if you are happy to come and teach yourself or learn by watching others then we’d love to have you. In time we will all learn. If you’re interested in volunteering then why not have a chat with one of our mechanics next time you come down, women/trans volunteers are particularly welcome. After the session we’ll have a debrief and if everyone is happy then we’ll hold an induction session for you within a month. For more see our volunteer induction. Happy to volunteer one evening a week (Wed best, Mon ok) if needed. Brilliant, come on down to a session Chris and we’ll give you details of the next volunteer induction. Would be happy to volunteer a couple of day a week between 10am and 2pm due to comittments, i am not a machanic but have been riding road and mountain bikes for quite a while. Ok thanks for the reply, i could help on a Saturday but not until the middle of May i also have a old mountain bike that i don’t need if you wont it. and to help people. If it’s possible to join. Thanks for your interest in volunteering with us! Have you been down to the workshop yet? It’s best you come down and chat to one of the volunteer mechanics in person about volunteering, during one of our drop-in sessions. I’d be happy to volunteer on Saturday or Wednesday afternoons. I’m a mechanical engineering student and a keen bike rider.